In this current difficult financial climate, less and less money is likely to be made available for the preservation and restoration of the nation’s built heritage. This means that even less will be made available for the Cinderellas of the built heritage world: military structures. Now, more than ever, architects and developers must be encouraged to find innovative uses for some of the most historically important military structures still remaining in the United Kingdom, rather than let them fall into a further state of dereliction and decay. Today, there is a host of such structures ranging from the purely military to the semi-military industrial sites – dockyards and explosive and mustard gas factories. All these are an extremely important part of our military heritage and the history of our country. When Henry VIII was faced with a possible invasion from France by forces intent on re-establishing the Pope’s authority in England, he built the first significant line of coastal forts and blockhouses since Roman times. Today, these forts are accepted as significant heritage sites; they are in the hands of English Heritage and are visited by thousands of people every year. Sadly, that is not the case for many of the large Victorian fortifications or the defences built to defend the United Kingdom against a threat of invasion in 1940, a more significant threat than Henry VIII faced 400 years earlier. The preservation of significant military structures presents a huge number of problems to those intent on restoring and re-using them. The fortifications are frequently very large, in a derelict state and, in the case of WWI and WWII structures, built in haste and of inferior materials. However, many of the Victorian forts are handsome structures built of brick or ashlar with fine architectural details, and they are often sited in beautiful locations. The key to the preservation of these buildings that are such an important, though too often little recognised, part of the nation’s built heritage must be found in innovative re-use. There is, of course, much opposition, both within the heritage community and outside it, to the adaptation of historic buildings to what is felt to be the detriment of their original design. Yet not every fort or barracks can be returned to its original state without there being an effective financial plan in place to maintain it. It is, of course, important that a number of representative military structures are returned to their original state so that future generations may appreciate their construction and role. Organisations such as English Heritage, Historic Scotland, and CADW have restored a number of forts and batteries to their original condition. Many local charitable trusts have also done good work in taking over and restoring individual forts and batteries. However, there is a limited number of opportunities to convert large forts into museums or art centres. Architects and developers must therefore be encouraged to convert these large structures for other uses, while at the same time ensuring the preservation of their important features. The most common form of re-use today for forts and batteries is as residential accommodation, and this is particularly the case with major complexes. 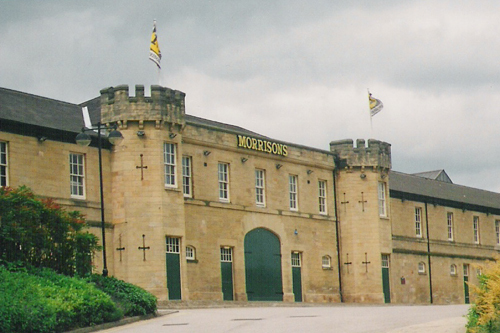 However, not all such structures lend themselves easily to such conversion, and among examples of other uses is Hillsborough Barracks in Sheffield, which has now been converted to a large retail business complex while still retaining its integrity as a listed building. Fort Horsted near Chatham, too, is now sympathetically restored in conjunction with English Heritage, and used as a small business park. The smaller 20th century defences are more difficult to adapt for viable economic use. However, many of the concrete pillboxes, gun batteries, and searchlight positions are now very much a part of the landscape in which they stand. They are memorials to what was one of the finest periods in our country’s history, and although they may not possess the architectural merit of the Victorian fortifications, they must not be simply bulldozed into obscurity.